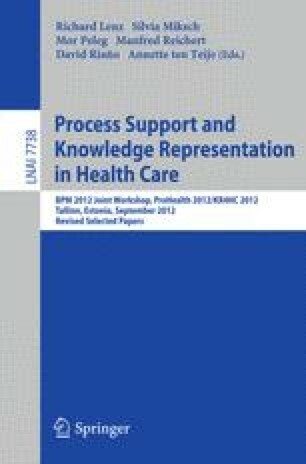 This work presents an approach for representing and managing medical exceptions that may occur during the execution of a patient-centered care pathway. Personalized care pathways are generated automatically by means of a knowledge-driven planning process over a temporal hierarchical task network (HTN), which encodes an evidence-based clinical guideline. The exceptional situations specified in this guideline as well as the recommendations for their management are represented by knowledge-based rules in the task network model. However these rules, which encode the exceptional flow of the guideline, are represented separately from the normal flow in order to not obscure the modelling. Moreover, we propose the use of medical concepts from a standard terminology (UMLS) for the formal representation of these rules. This fact promotes interoperability, knowledge sharing and precision aspects. Finally, a therapy planning system with capabilities for exception detection, analysis and adaptation has been developed. As a result, the proposal, which is evaluated with oncology care plans, seems to be an adequate exception recovery mechanism maintaining guideline adherence. This research work has been partially supported by the Andalusian Regional Ministry and the Spanish Ministry of Innovation under projects P08-TIC-3572 and TIN2008-06701-C03-02 respectively.